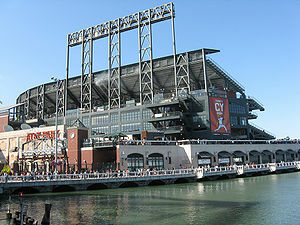 Oracle Park (formerly AT&T Park) is the home of the San Francisco Giants. As an urban ballpark, it is served by buses, trains, and ferries. This park also has valet bicycle parking. From downtown and other parts of San Francisco, take Muni Metro or train to 2nd & King Station, which is located on King Street adjacent to the ballpark. Special service is provided before and after ballpark events. After Giants games, Muni employees will check passengers for valid fare at the platform entrance. Riders can pay for the fare at Giants sales windows on King St. The nearest BART station is almost a mile from the ballpark. BART riders to the ballpark can get off at Embarcadero Station, walk up to the concourse, and transfer to Muni Metro trains to the ballpark. Muni Metro requires a separate fare and discounted round-trip Muni tickets are available before ballpark events at the at Embarcadero Station BART exit. Alternatively, BART riders can get off Montgomery Station and walk south on 2nd Street to the ballpark. From the Peninsula and the South Bay, take Caltrain to San Francisco (4th & King Station). From the station, walk one block west along King Street to the ballpark. Caltrain provides special service to and from Giants' home games as well as major concerts at the ballpark. Special ferry service is provided to most Giants home games from the North Bay and East Bay. 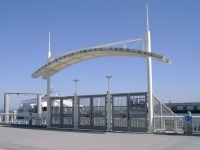 The ferry terminal is located by the McCovey Cove near the marina. When special ferry service is not available, take regular ferries to the Ferry Building, and transfer to Muni Metro at Embarcadero Station to the ballpark. All these routes stop about a block from the ballpark. This page was last edited on 10 January 2019, at 22:50.